Natürliche Schopfungsgeschichte. Berlin: Reimer, 1898. 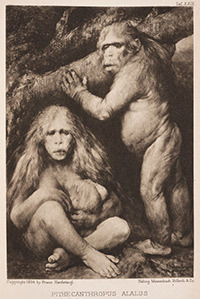 Gabriel von Max (1840-1915) was an Austrian artist who liked to paint primates, and he often used them as human surrogates, as when he substituted apes for art critics in his painting, “Monkeys as Judges of Art” (1889). 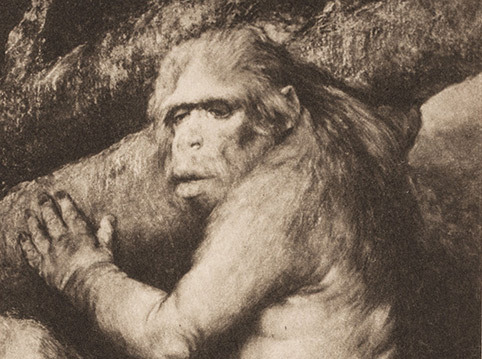 For a new edition of Haeckel’s book on the history of nature, Max painted what we might call “The First Family,” in that his intent was to portray what Haeckel called Pithecanthropus, the ancestor of the entire human lineage. Some have argued that Max was making sport of anthropologists, the same way he poked fun at art critics, but others find this to be one of the most poignant of all the nineteenth-century attempts to recreate a Paleolithic pre-human family.